A few years ago we might have thought a story about drones delivering parcels for Amazon would be pure science fiction! It turns out though that Amazon believes that by 2015 it will be doing just that. They will be delivering parcels within a 50 mile range of their major distribution centers. There’s a lot of development work to take place between now and then. But this is the stuff of pure science fiction becoming reality. 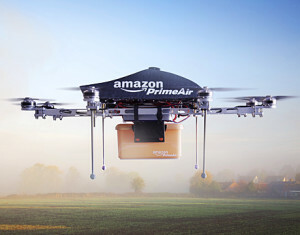 We read the story about Amazon intending to use drones to deliver parcels in December 2013. It is only two years away at the time of writing this article. We anticipate that the initial wave in 2015 will be just the beginning. They are still working to perfect the system. There will be many drones delivering as well as monitoring our services and our lives in the future. Can you imagine ordering a diamond ring through Amazon in the morning. A few hours later the package is dropped on your front doorstep by a buzzing drone with eight rotating blades! This is the current plan of Amazon to be able to arrange for same-day delivery of small packages and parcels to their customers. The drone may be controlled by an operator back at the plant or even at a central control agency. It will be equipped with video cameras. As well as microphones and speakers to communicate with customers. This is to ensure that the packages are delivered to the correct person at the address it is to be delivered to. We may even have to provide a thumbprint to ensure that we are the right person that the package should be delivered today. There are lots of processes to be worked out. There are rules and regulations to be developed to ensure that the public is safe from buzzing drones over our heads. As well as the lighting or avoiding collusion with low-flying aircraft. A lot of work will need to be done over the next few years to develop this into a full-blown service delivery opportunity. We can’t wait for FedEx and UPS to also become interested in this type of service delivery. More to come. « Canada Post pensions at risk?